We are first time cruisers in our 40&apos;s and chose Celebrity due to it&apos;s high ratings for service and food. We were looking for warmth and relaxation but also some good excursions that combined history, physical activity and beautiful views. We had a Concierge cabin (1149) with a larger than average balcony due to the location being the last cabin starboard. There was quite a bit of motion/rocking due to moderate seas and likely the cabin location but otherwise noise was not an issue. We rate the cabin&apos;s organization highly with plenty of space for storage of clothes, toiletries, shoes, etc. As expected service was really, really good. Standouts include Savio (stateroom attendant), Linda (MDR Hostess), Sergio (waiter) and Abdulali (assistant waiter). We thought the food was so-so. We ate in Tuscan and my husband needed to send his steak back twice due to it being undercooked. He finally just asked them to bring him an order of lasagna which was quite good. My steak was cooked to order but the sauce/jus tasted like canned broth. Service, however, was excellent. We also ate at Silk Harvest. We had booked it online via the Celebrity app and did not realize the night we booked was a special event (Silk and Soul) and included a multi-course set menu, with the majority of courses consisting of seafood. This was fine for me but not for my husband who is allergic to most seafood. Had we known we would not have booked for this particular night. The restaurant manager was kind enough to offer my husband food from Blu which he did enjoy. We enjoyed MDR breakfast more than the buffet so did that most mornings. MDR dinners were a bit hit or miss for us (highs included beef wellington, turkey, and cheesecake. Lows included chicken and salmon-both overcooked). We did a Celebrity shore excursion in San Juan (Old San Juan Food and Walking Tour) which was very good. The guide was very knowledgeable of Puerto Rican history and very engaging. We had booked a ziplining adventure in Punta Cana (through an outside vendor) but the ship was unable to provide tender service due to rough seas so this day was essentially another sea day. In St. Thomas we did our own thing, riding the gondolas up to Paradise Point and souvenir shopping. In Nassau, we went to the British Colonial Hilton and had a relaxing beach day. All in all this was a very relaxing vacation. Almost too much so for me. I think if we had been able to do our excursion in Punta Cana I would rank our week a bit higher but I found myself bored at times. The only show we attended was a special guest singer, Ashlie Amber Harris, who was outstanding. Disembarkation went very smoothly for us (we checked one bag on the last night). Overall we did enjoy our first cruise. It was certainly relaxing and the service and cleanliness of the ship was top notch. I definitely think I would prefer a more port-intensive trip so will focus more on specific destinations and excursions for the next cruise we book. We are first time cruisers in our 40&apos;s and chose Celebrity due to it&apos;s high ratings for service and food. We were looking for warmth and relaxation but also some good excursions that combined history, physical activity and beautiful views. We had a Concierge cabin (1149) with a larger than average balcony due to the location being the last cabin starboard. There was quite a bit of motion/rocking due to moderate seas and likely the cabin location but otherwise noise was not an issue. We rate the cabin&apos;s organization highly with plenty of space for storage of clothes, toiletries, shoes, etc. As expected service was really, really good. Standouts include Savio (stateroom attendant), Linda (MDR Hostess), Sergio (waiter) and Abdulali (assistant waiter). We thought the food was so-so. We ate in Tuscan and my husband needed to send his steak back twice due to it being undercooked. He finally just asked them to bring him an order of lasagna which was quite good. My steak was cooked to order but the sauce/jus tasted like canned broth. Service, however, was excellent. We also ate at Silk Harvest. We had booked it online via the Celebrity app and did not realize the night we booked was a special event (Silk and Soul) and included a multi-course set menu, with the majority of courses consisting of seafood. This was fine for me but not for my husband who is allergic to most seafood. Had we known we would not have booked for this particular night. The restaurant manager was kind enough to offer my husband food from Blu which he did enjoy. We enjoyed MDR breakfast more than the buffet so did that most mornings. MDR dinners were a bit hit or miss for us (highs included beef wellington, turkey, and cheesecake. Lows included chicken and salmon-both overcooked). We did a Celebrity shore excursion in San Juan (Old San Juan Food and Walking Tour) which was very good. The guide was very knowledgeable of Puerto Rican history and very engaging. We had booked a ziplining adventure in Punta Cana (through an outside vendor) but the ship was unable to provide tender service due to rough seas so this day was essentially another sea day. In St. Thomas we did our own thing, riding the gondolas up to Paradise Point and souvenir shopping. In Nassau, we went to the British Colonial Hilton and had a relaxing beach day. All in all this was a very relaxing vacation. Almost too much so for me. I think if we had been able to do our excursion in Punta Cana I would rank our week a bit higher but I found myself bored at times. The only show we attended was a special guest singer, Ashlie Amber Harris, who was outstanding. Disembarkation went very smoothly for us (we checked one bag on the last night). Overall we did enjoy our first cruise. It was certainly relaxing and the service and cleanliness of the ship was top notch. 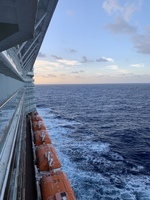 I definitely think I would prefer a more port-intensive trip so will focus more on specific destinations and excursions for the next cruise we book. We did a beach day at the British Colonial Hilton which is a short walk from the ship. Very relaxing, plenty of loungers available, good service. Rode the gondolas to Paradise Point where the views were magnificent.